This is the drawing for Design 1F for the Alkaid class “Liberty” cargo ships of (EC2-S-C1) maritime hull dated January 29, 1944. The open measure colors were shown, but would have been dull black (BK), ocean gray (5-O) and light gray (5-L) for Measure 32 or navy blue (5-N), haze gray (5-H) and pale gray (5-P) for Measure 33. 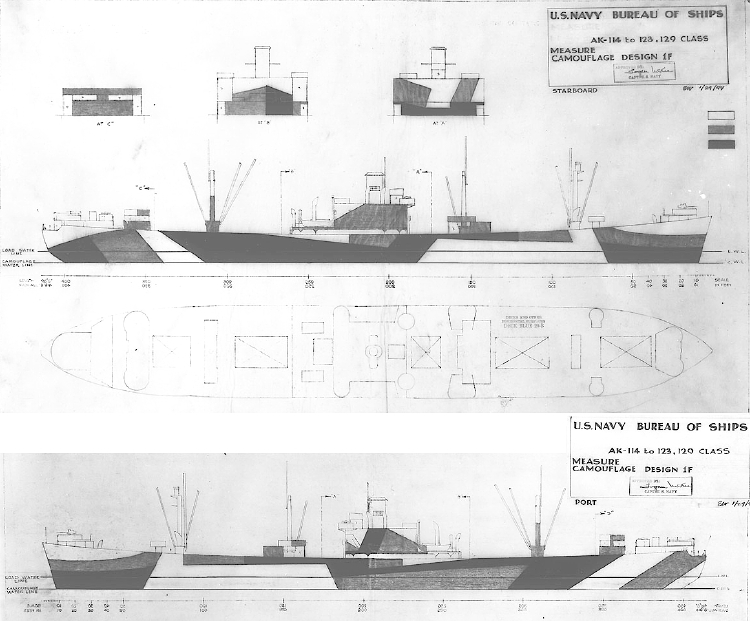 The first drawing for Design 1F was for “Liberty” style cargo ships using feathered edges was attached to the March 1943 supplement to SHIPS-2. 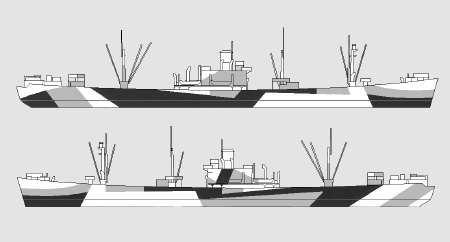 On January 29, 1944, Design 1F was redrawn using “open” measure colors and with solid edges for the Alkaid class “Liberty” style cargo ships as above. Then Design 1F was drawn for the Barnegat class small seaplane tenders on March 6, 1944. Original drawing source: NARA 80-G-105492 and 80-G-105493.